I’m not calling this “inspiration” because it’s all that inspired. Or inspiring. Or even interesting. It’s just that calling it a “recipe” feels dirty and cheap the way Sandra Lee punching out a Pop-Tart with a heart-shaped cookie-cutter and calling it a semi-homemade breakfast of love feels, you know. Add some salsa verde. 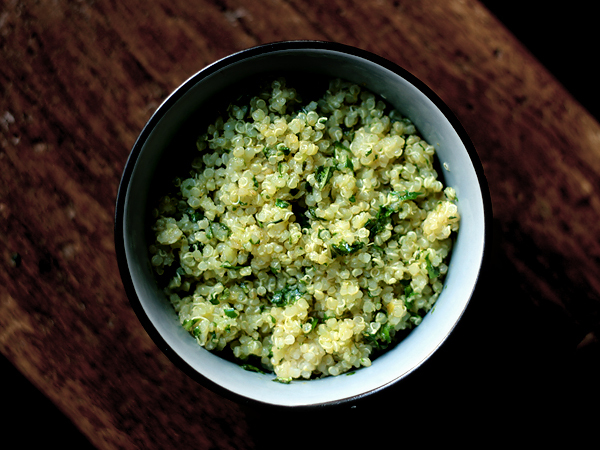 For 2 cups of quinoa, I used about 2 tablespoons of salsa verde. Toss with quinoa and vegetables until everything is nicely coated. Taste. Add more salsa verde if necessary. Season with more olive oil, salt, pepper, and/or fresh lemon juice if necessary. And it’s probably necessary because who gets it perfectly exactly right the first time ever? I like quinoa and/or brown rice for everything. Unless I feel like buckwheat soba. We mixed quinoa and straight salsa verde for one bowl, and chickpeas, tomatoes, and parsley in another because that is what we had on hand (I realize this is slightly incestuous since there is already a ton of parsley in the salsa verde). 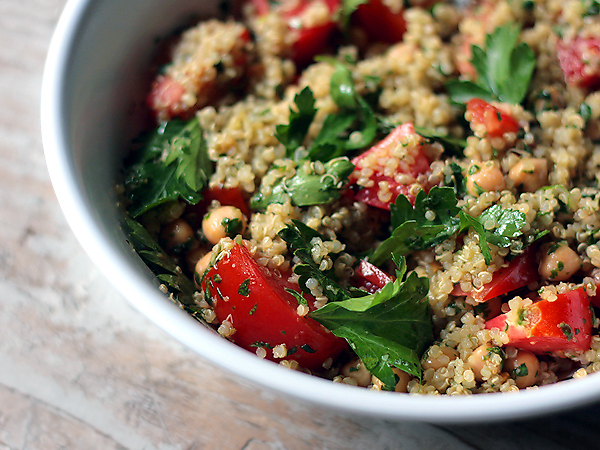 It tasted a bit like tabbouleh, a bit like the “Hummus Quinoa” we had a few weeks ago. This is so redundant. Clearly, a reflection of my life, right now.